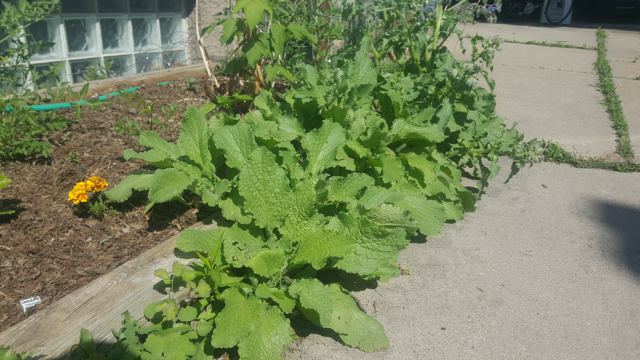 Garlic scapes, the thick stem growing out of hard neck varieties, have been spotted in several community garden plots. I like to write about them to a) let you know they are up, b) remind you to remove them and why and c) what to do with them. In a word - delicious. 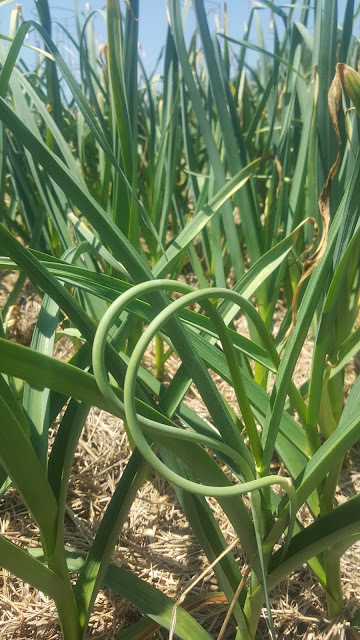 Garlic scapes are that curly "whip" that grows up the stem of hardneck garlic. Softneck garlic does not have this whip, and I recently learned that most commercial garlic found in the grocery store is softneck precisely because growers don't have to deal with the scape. "Deal with?" you ask. 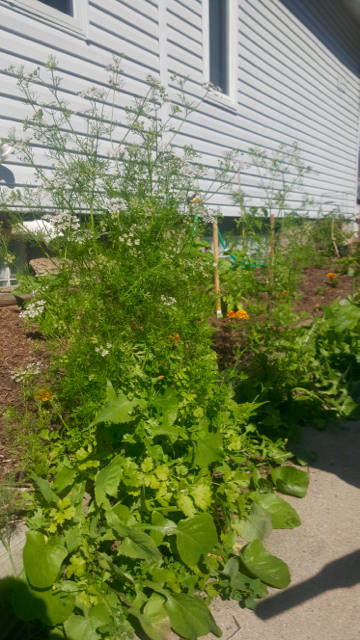 If the scape is not removed, the plant will put lots of energy into developing a flower and seed pod, thus leaving less energy for the underground crown which is what we harvest in July. 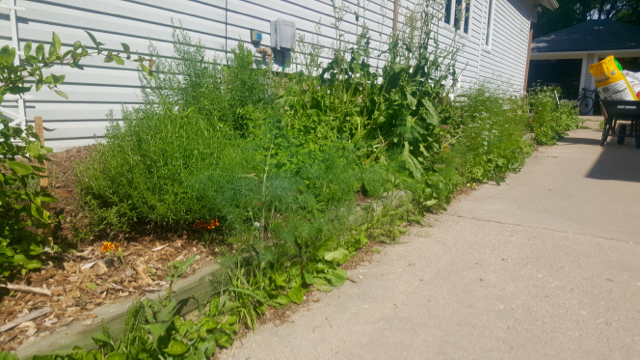 Removing the scape not only helps develop a larger crown of garlic, it's also tasty. 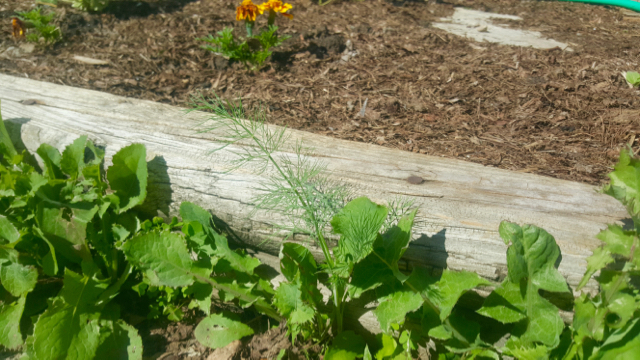 This year I planted more than 100 cloves, which means I have that many scapes to harvest. 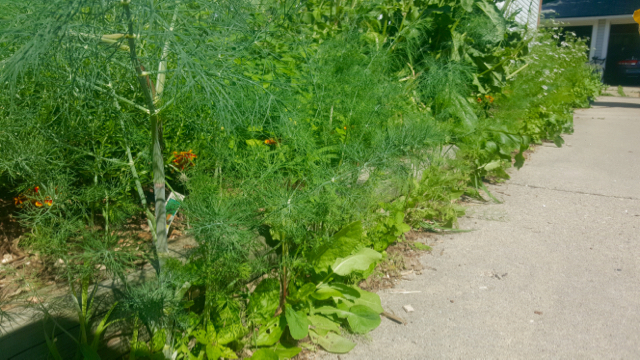 Wait until the scapes curl. 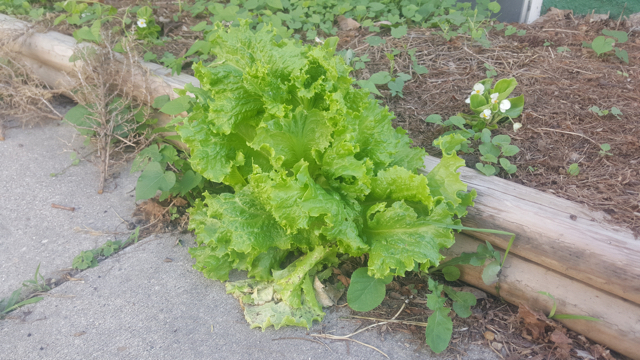 Harvesting them too early and they'll grow back. 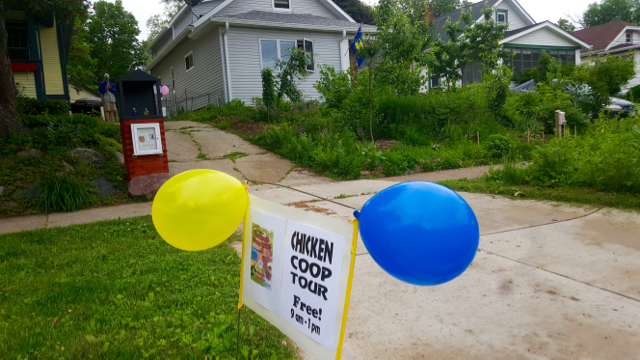 Jay, Matt, Marisa and I participated in the June 4, 2016 Mad City Coop Tour, a self-guided tour of 11 chicken coops around Madison and surrounding suburbs that (presumably) allow back yard chickens. The tour lasted from 9 AM to 1 PM. Jay and I had the first shift from 9 to 11, after which I took my nieces and nephew to the children's opera for a 45-minute version of “The Magic Flute." 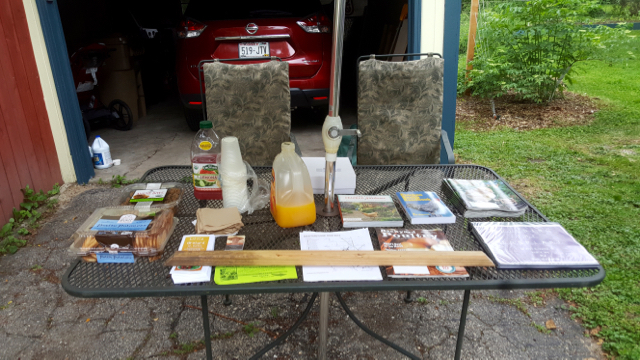 We set a table with literature that the coop tour organizers provided, a stack of magazines, a few printed maps of the other coops on the tour, and some snacks. We also had a foot washing station for people to step into — a 1:32 solution of bleach to water to help prevent the spread of disease from coop to coop. The 2015 Coop tour was canceled due to an outbreak of bird flu in Wisconsin. Fortunately, that your I did not hear of any backyard flocks affected by the disease, but several large-scale poultry operations had to destroy it many, many birds and the coop to organizers did not want to take that risk. I really enjoyed putting together a slide show of the coop building and the first year of the bird’s growth, and printed it out for people to page through. 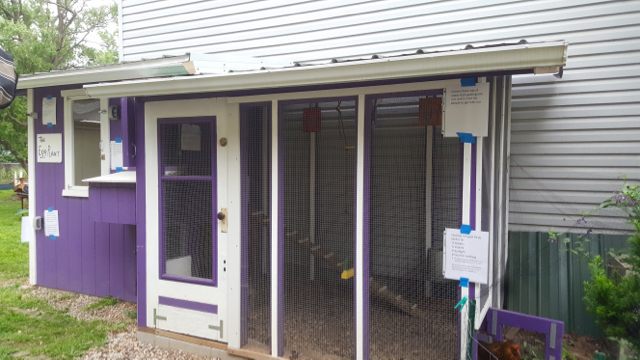 I thought you’d enjoy seeing in, and thanks to the Internet and decent bandwidth, you can download a Powerpoint or a PDF of the show to see photos of the coop construction and photos of our birds. 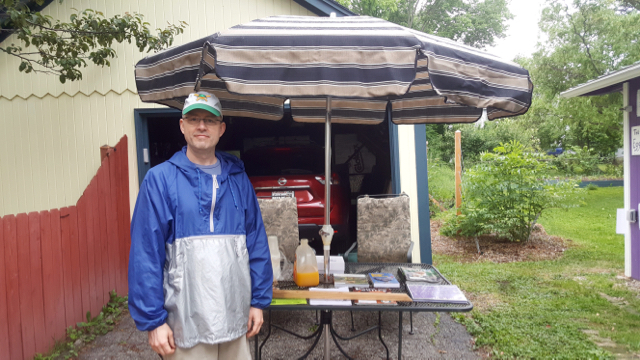 Jay and I prepared a table with sprinkles of rain in the air. The light drizzle passed before the tour started. I created signs to hang on the coop to highlight some of our favorite features and lessons learned. 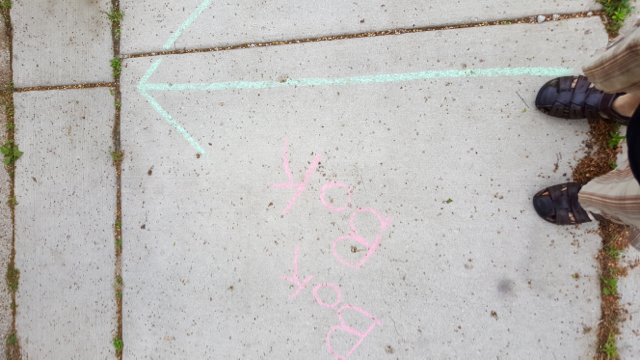 The coop tour organizers even provided us with sidewalk chalk -- we marked the road too. So impressed with the tour organizers, they provided magazines, extra maps and other literature. We added some of our favorite books and the snacks. All set and ready to tour.